Window mounted air conditioning units come in all shapes and sizes from small to large. 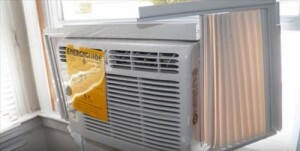 If you have a small window and need an air conditioner there are many small sized units available. Keep in mind the smaller the unit the less it will be able to cool as the compressor and condenser will be smaller. 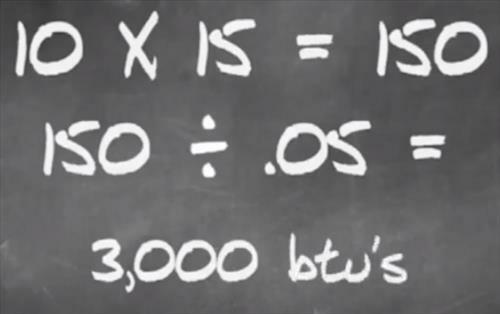 A units size is measured by Width, Height, and Length in inches. For example 14 x 18 x 12. Getting the right dimensions are crucial to getting a unit to fit. Besides fitting into a window the BTU cooling capacity should also be considers for the best results. How big a room is should match the BTU cooling capacity of a unit. Calculating this is easy by measure the width and length of a room for the square feet. For example a 10 X 15 room would be 150 Sq Ft which a chart will show needs a 3,000-5,000 BTU unit. 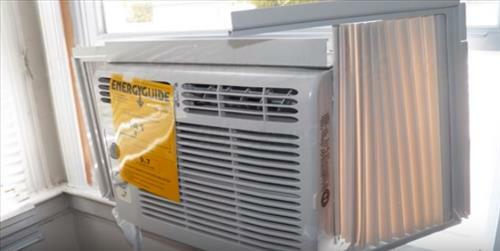 Read Here for More on sizing an A/C unit along with a BTU chart. 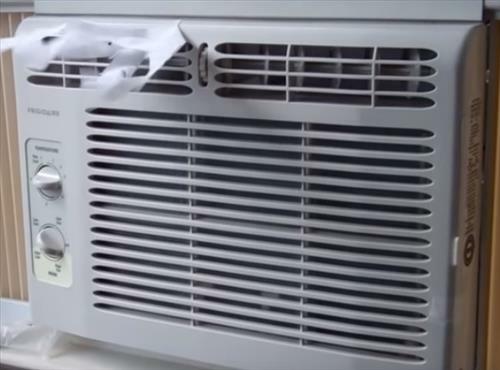 There is many small and low-cost window air conditioning units with the ones below simply ones we have found. As always be sure to read reviews on Amazon, here, or elsewhere to be sure a unit is the right pick for you. This unit from Frigidaire is small 15 x 16 x 12 inches, so it fits into a very small opening. It is 16 inches wide and 12 inches in height so be sure to measure your window for a good fit. It comes with side panels that pull out to fill any open space if a window is larger. It has a 5,000 BTU cooling capacity which is rated to cool a room up-to 150 square feet (10 x 15 feet). How well it cools will also depend on how hot it is and how well the room is insulated. The weight is roughly 50 pounds which makes installing it easier than heavy units. There are two speeds for fan or cool. The controls are mechanical with no remote. For power it plugs into a standard 115 Volt wall outlet. 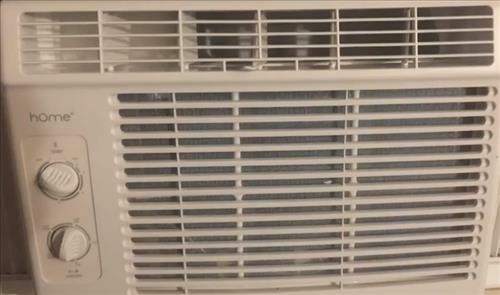 This is a no frills basic window air conditioning unit that has basic controls. It has been manufactured this way to keep it small and low-cost. This unit from hOmeLabs is 16 inches long x 12 inches high x 15.4 inches deep. It is 5000 BTU unit rated to cool a room up-to 150 Sq Ft. The unit has two mechanical controls for temperature and cooling. This unit from Midea 16 x 18.5 x 13.4 inches which is slightly larger those those above. While larger it does have better cooling capacity at 6000 BTU. This means it can cool a space up-to to 260 square feet. 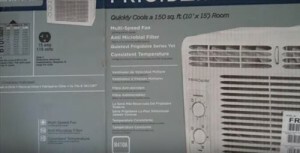 There is no doubt many good small quiet windows AC units available. The units above are ones we have found that are built to be mini, compact, and good for those on a budget. This means they are a good fit for anyone looking for a low cost air conditioning solution for a small room. How well the room is insulated and how often a door is open will all effect the cooling of a small unit. 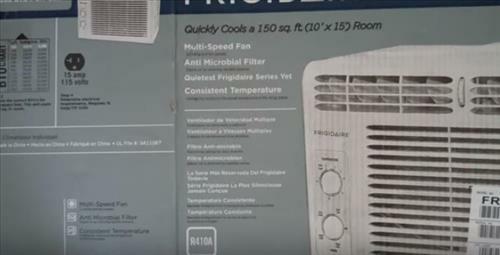 Is there any way one can set up one of these small a/c’s to cool down a tent in a campground? Even if I need to build a mini space outside the tent to house the body of the unit. How wide is it? From side to side?